The Leader’s Institute ® has been partnering with event planner Cerbelli Creative for several years. 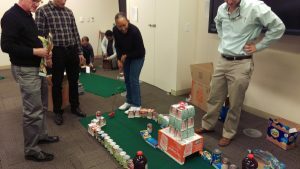 So when this event planner wanted a fun team building event for a competitive group in Los Angeles, we recommended The Ace Race ® mini-golf team building event. 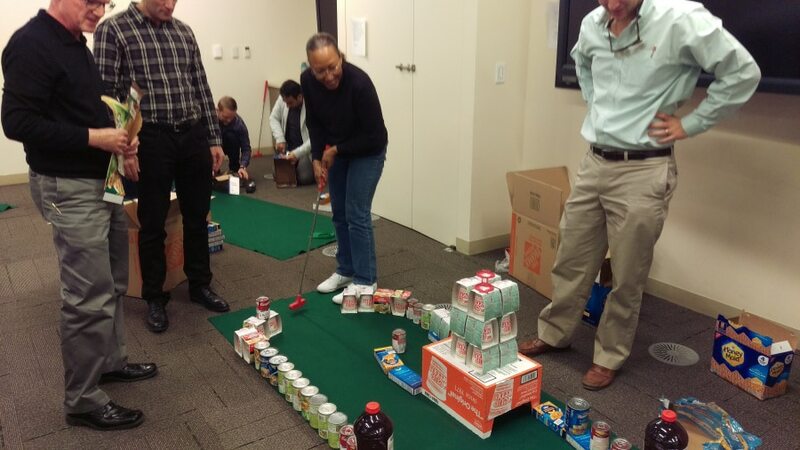 In this event, individual teams have to work together to create a mini golf hole using non-perishable food items, which are later donated to a food bank or food pantry. After a quick warm-up to get the energy level up, Los Angeles based instructor Chris McNeany explained how the event would work. Each group has to design a mini golf hole where you can get a hole-in-one. Once each group has shown that they can get the hole-in-one on their mini golf hole, then the entire group plays the whole course. Teams advanced to another mini golf hole when one participant got a hole-in-one on the current hole. Groups used strategy to make their mini-golf hole challenging. However, they couldn’t make the hole so challenging that they wouldn’t be able to get the hole-in-one. This group had a great time working together designing and re-designing the course. They had a blast seeing which team could get through the course first. The food was donated to Westside Food Bank, who was thrilled to receive the donation. Most of their donations come during the holidays. Fun Team Building Event for a Competitive Group. Are you looking for a fun team building event for a competitive group? Call us toll-free at (800) 872-7830 for details.